CONGRATULATIONS! IT’S THE BIGGEST DAY OF YOUR LIFE! The day you’ve been dreaming about since you were a little girl. You don’t think twice about budgeting for that fabulous designer dress, Valentino heels or even that expensive fine art photographer to capture every moment! So why would you forget to budget for the most important part of your wedding day – your face? Though it may seem like a large expense to hire a professional makeup + hair artist for your big day, remember that your beautiful face will be in every one of those pictures you hired that amazing photog for! In the grand scheme of things, hiring a professional makeup and hair artist only accounts for a fraction of your overall budget! Isn’t your face worth it? 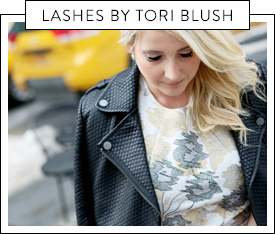 Let Tori Blush bring their luxury beauty services to you on your wedding day! 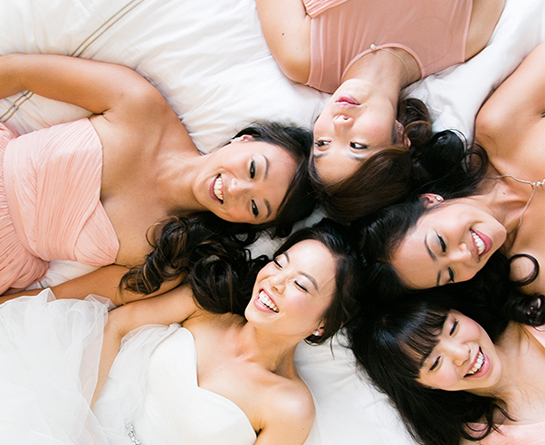 Let us take the stress of the BIG day away and pamper you and your best friends! You deserve it! FOR THE BRIDE . . . This bridal package includes everything! AIRBRUSH makeup, hair design, false lashes & application, brow grooming and full size lip gloss. You will be styled start to finish by Principal Artist, Suzanna Chun. AIRBRUSH makeup provides flawless coverage that doesn’t look or feel caked on…and the best part is, it lasts and lasts – even through the heat and all the tears! This service (normally an added fee by other artists) is provided at no additional charge! This bridal package includes everything! AIRBRUSH makeup, hair design, false lashes & application, brow grooming and full size lip gloss. You will be styled start to finish by a Lead Artist, professionally trained and hand picked by Suzanna. Your consultation and trial is the perfect opportunity for you to meet and get acquainted with your Makeup + Hair Artist. This service includes color consultation – discussion of wedding theme, colors, desired makeup+hair for the day, face chart, full application of makeup including false lashes and trial of your hair design. This service is optional for bridal party members and mothers. Up to 2 hrs. FOR THE LADIES CLOSEST TO THE BRIDE . . .
*complimentary makeup for flower girls 4 and younger. All makeup applications for Bridesmaids and Mothers include AIRBRUSH makeup and false lashes. Package includes AIRBRUSH makeup, casual hair styling and false lashes (optional). This package is for the bride who is doing a pre-wedding day photo shoot in full makeup+hair and dress. This package includes recreating your wedding day makeup+hair. Includes AIRBRUSH makeup, hair design and false lashes. This service includes a new vamped up evening makeup and hair change for the bride. Travel included. Any parking fee at second venue is additional. This service includes a new vamped up evening makeup for the BRIDE and touch up service for all ladies whose makeup was done by Tori Blush. (Limited to parties of 5. Each additional BM touch up is $20). This includes travel to any location within the Greater Vancouver Area. Any parking fee at second venue is additional. 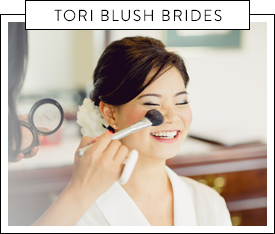 This service includes a new vamped up evening makeup + hair change for the BRIDE and touch up service for all ladies whose makeup was done by Tori Blush. (Limited to parties of 5. Each additional BM touch up is $20). This includes travel to any location within the Greater Vancouver Area. Any parking fee at second venue is additional. ALL DAY SERVICE FOR THE BRIDE $75/HR. This service includes a principal or lead artist to follow alongside you for as many hours as you need. Have as many touch-ups, makeup or hair changes as you please. Perfect for the Bride that wants to look perfect at every moment and change up her makeup+hair for dress changes. Hourly charge begins after initial service is complete. FOR THE GROOM . . . Makeup for the groom might seem like an odd request, but you’d be surprised at how easily redness, dark circles, last minute blemishes or uneven skin tone can be erased with the magic of makeup. Only no one will even suspect he has any on! 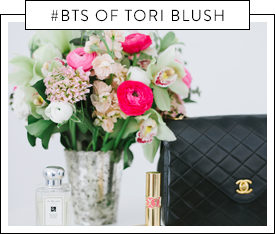 *Upon booking Tori Blush Bridal Services, a non-refundable 50% deposit is required to secure your wedding date. *Booking with Tori Blush is not confirmed until a deposit has been made and contract has been signed. *The remaining balance of 40% must be submitted on or before the wedding day, prior to the commencement of service. * Consultations and trials are required for all brides prior to wedding date and are done at our Tori Blush Studio in New Westminster. *Minimum booking for wedding day service is Makeup + Hair for 4. *All services to be completed in one location only. *$40 travel fee for wedding day service. *Payment may be made in Cash, Credit, Cheque (payable to Tori Blush Inc.) or Interac E-Transfer to hello@toriblush.com. *Gratuities and parking fee (if applicable) not included. To request a booking for a consultation/trial, please contact hello@toriblush.com directly or use contact form.